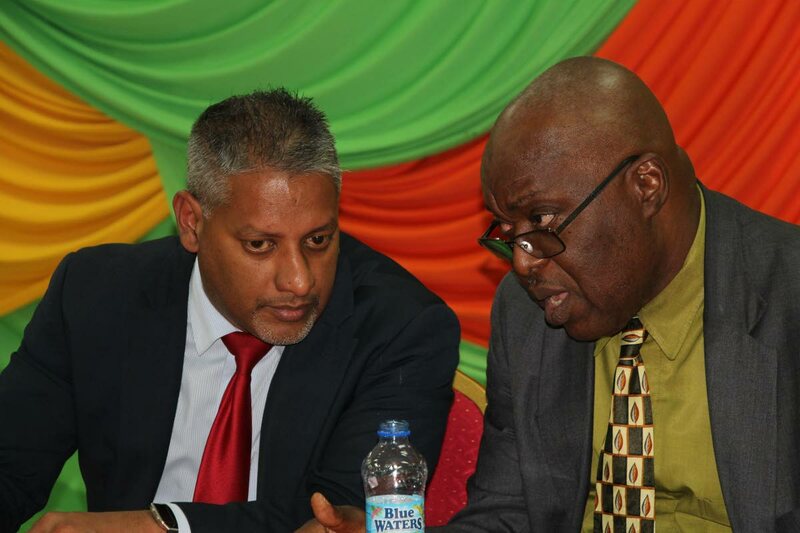 Chief Secretary Kelvin Charles, right, speaks with Agriculture Minister Clarence Rambharath at the Tobago launch of the incentive programme - the National Agricultural Finance Support Programme (Agro-Incentive) last Wednesday at the Division of Community Development, Glen Road Scarborough. Tobago’s agriculture revitalisation programme supported by a financial incentive programme from the Government would contribute significantly towards reducing the island’s food import bill. So said Chief Secretary Kelvin Charles, speaking at the Tobago launch of the incentive programme - the National Agricultural Finance Support Programme (Agro-Incentive) last Wednesday at the Division of Community Development, Enterprise Development and Labour, Glen Road Scarborough. Agro-incentive will provide investment opportunities of up to $100,000 for agricultural development, assistance to new farmers, upgrade of breeding stock, increasing productivity, food safety compliance projects and for investments in specialised modern technology and equipment. Scores of farmers, fisherfolk, agro-processors turned out for the event. Charles, in predicting a boost to the agriculture and fisheries sectors with Agro-incentive, said the thrust would create sustainable employment opportunities particularly for young people, help diversifying the island’s economy, generate export earnings and improve food security. Agriculture Minister Clarence Rambharat, delivering the feature address at the launch of the incentive, gave a commitment to assisting Tobago farmers. “What I realise is good farmers need intervention. I don’t want to talk about land tenure because all of you know that is number one. In discussion with my colleges in both Trinidad and Tobago, even the Prime Minister (Keith Rowley) who is a farmer, and (Finance) Minister (Colm) Imbert, we felt that what we needed to do was create a product where good farmers would be able to have the intervention they needed,” he said. 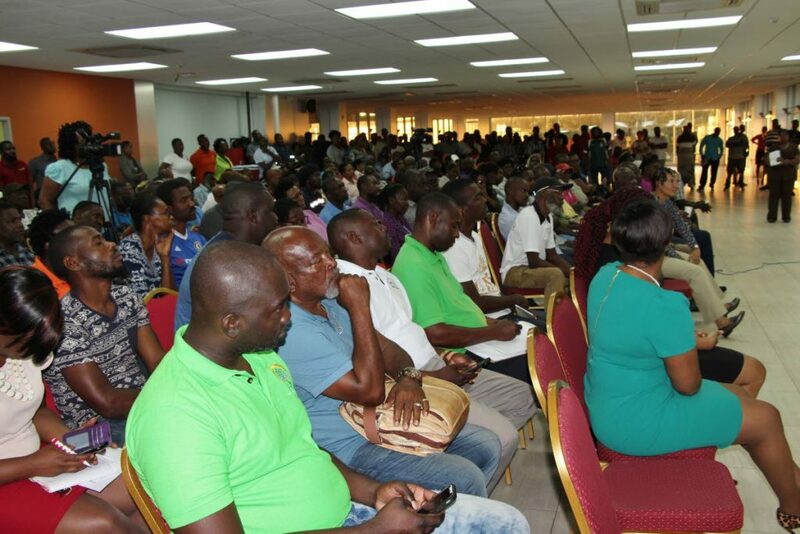 Stakeholders in the agriculture and fishing sectors pack the conference room at the Division of Community Development, Glen Road Scarborough last Wednesday for the Tobago launch of the National Agricultural Finance Support Programme (Agro-Incentive). He said with Agro-Incentive, Tobago’s crop farmers, fisherfolk, agro-processors, livestock and wildlife farmers could now seek to increase and improve production. “If we get people with good proposals and people who are sure, by their background, ability and qualifications, can do well in agriculture, then I’m happy. We would like to grow more food, but we can’t force people to farm and I’m not into the business of forcing people to farm. “The time it takes to call someone with no interest in farming to become a farmer is ten times as much as it takes to make an existing farmer a secured farmer,” he stated. He stressed that the Agro-Incentive programme would significantly benefit all productive farmers, processors and producers. Reply to "Agro-Incentive offers up to $100,000 financing for farmers, fisherfolk"